The US Telephone Switchboards – BD71 and BD72 kit from Plus Model, makers of 1/35th scale resin kits, conversion sets and accessories since 1990, is a 1/35th scale cast resin and photo etch set depicting the WWII field deployed switchboard. This was an extremely heavy wooden encased radio switchboard often accompanied by heavy file storage unit and side table. The BD 71 had a twelve line switchboard while the BD72, or also known as the SS-22, had a 6 line capability. Taking a close look through the parts of this kit, I noticed there is some flash which is typical from the resin casting process. For the most part this flash removes with the swipe of a finger, any residual flash will easily sand off. I only found one small bubble in the casting from this whole set. All of the pieces are cast very clean and have plenty of detail to compliment the two radio sets it is meant to depict. Some of the smaller pieces, like the legs to the smaller radio unit, are extremely delicate and care should be taken when removing these parts form the casting blocks. With most of the parts a quick score with a sharp hobby blade is all that is needed to weaken the bond of the parts to the casting blocks. As part of this set, there is a small sheet of photo etch parts. There are several small, delicate handles for the radios as well as carrying straps and two round ends for the included wire spool. Also, there are two sets of integral face plates for each Radio in the set. These two face plates are finely detailed and bring much eye candy these radios. In addition to the resin parts and the photo etch sheet, Plus Model supplied the kit with one length of copper wire for use with the two chairs and the table legs as well as a short length of solder wire for use on the switchboards as connections. The US Telephone Switchboard BD71 and BD72 kit will make an excellent addition to anyone’s diorama or vignette needing a field communications setup. The radios are finely detailed and are extremely close to looking like the actual field radio setups. The casting is crisp and even with the small amount of flash, easy to clean up and assemble. It would be advisable to have some experience working with resin and photo etch as the resin parts are a bit delicate when it comes to the radio stand and the straps intended for the carrying straps can be somewhat frustrating to assemble. With a little patience, this set will build up to a nicely detailed add-on for any WWII scene. Lows: Some of the smaller parts delicate and care should be taken during construction There could be a little more wire to fully wire the switchboards. Verdict: I feel this is a very nice resin kit that will bring plenty of detail in the right setting. Thanks Jerry. Good to know the service le goth of service of the setups. The range can be widedned a bit now. Great stuff - glad to know it is out there. Thanks Two comments: The table should be made available separately as the same design was used by the Army up through Vietnam. The large cable reel also came in a version only half as wide. (Same diameter but only 8 inches thick.) I know b/c I own one - not such a bear for two men to deal with when fully loaded with phone wire but still a hand full! Thanks Michael, some more useful information on this set! I would agree maybe a smaller set would be a good idea but since I build all over the genre scale, i could break the set up between builds and this would be even more cost effective. The reel is an interesting piece. 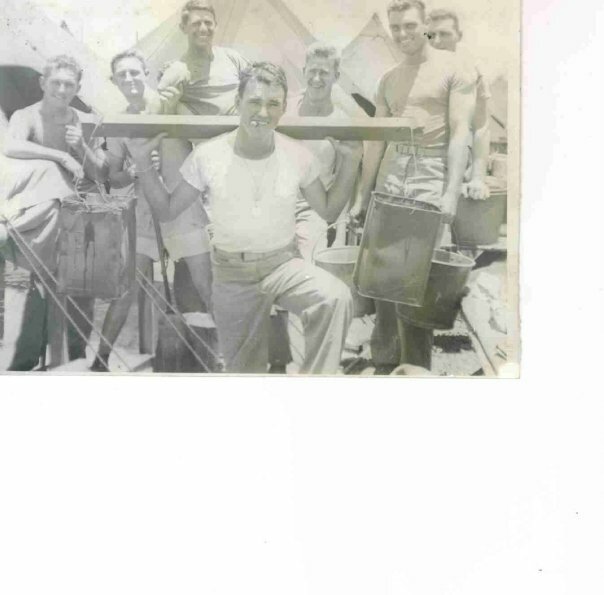 My Step Father (past 2000) work with communications with the 4th Marines in the Pacific from 42 on...got a couple pics that would make an interesting vignette some day!! You should share your Dad's photos (if you don't mind putting them out there?) We are grateful for your Dad's service! Semper Fi. I have only scanned a few in at the moment but here is one I have at hand. 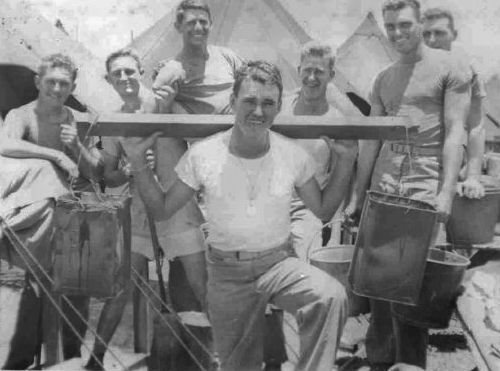 George W. Smith, second from the right. There was no labeling on where the pic was from but guessing Tinian, maybe Saipan as his time on Iwo was a bit more per-occupied...LOL! !These guys were a breed unto themselves! Todd, thought you might fancy a slightly enhanced version of your Dad's photo. Hope you don't mind. Thanks Michael! No problem,it looks a bit better!